Sometimes you run across something so great, you just have to share it with everyone. We recently installed a garage canoe hoist as part of a custom garage organization project and we have to say, we were impressed! 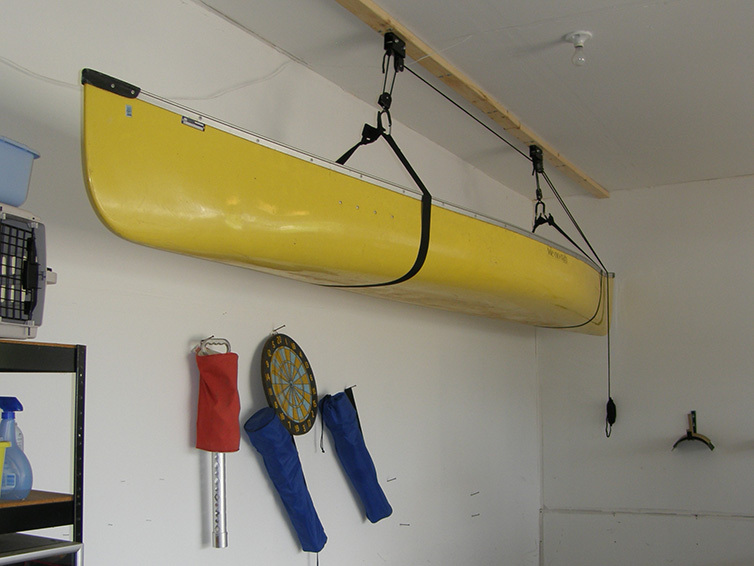 If you own a canoe or kayak, a canoe hoist is a slick solution to store your canoe or kayak in your garage without taking up valuable floor space. The ceiling mount design allows a kayak or canoe to be stored in a garage near the roof, ensuring there is plenty of room to park a vehicle underneath. It can easily be operated by 1 person and holds up to 125 pounds. Up, up and away with your canoe – it couldn’t be any easier. If you are considering a garage organization project, we encourage you to peruse our garage cabinets & shelving and Gladiator garage organization photo galleries or, better yet, have us out for a free in-home consultation! We’ll meet with you on-site to discuss your ideas and your needs and follow up with a 3D CAD drawing of our proposed design, all free of charge! Based in the Twin Cities, Closets For Life is a custom organization company that works with residential clients as well as designers, builders, remodelers and architects to create innovative solutions for all organizational needs including garages, closets, kitchens, mud rooms, home offices, Murphy beds, wine cellars and more.